I like little changes. Subtle changes that make a BIG difference. Cheap? check. I.heart.throwpillows. 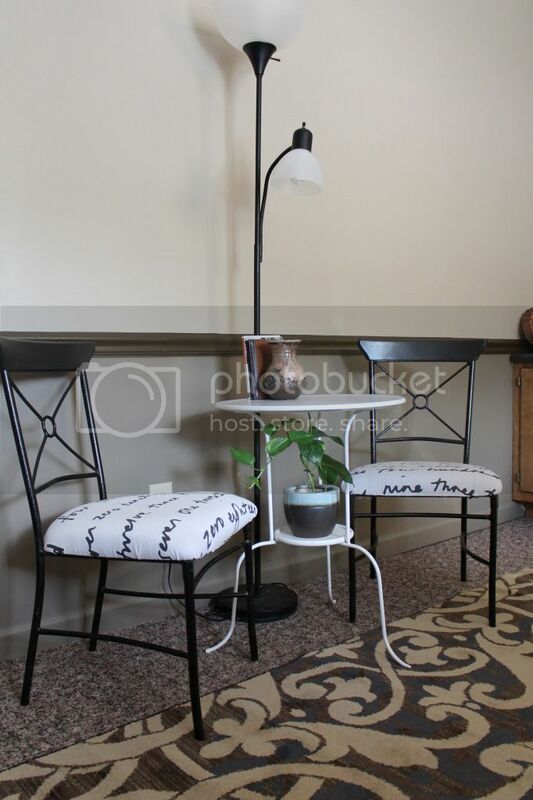 There is something about how easy they are to swap out, and how quickly they brighten a room. 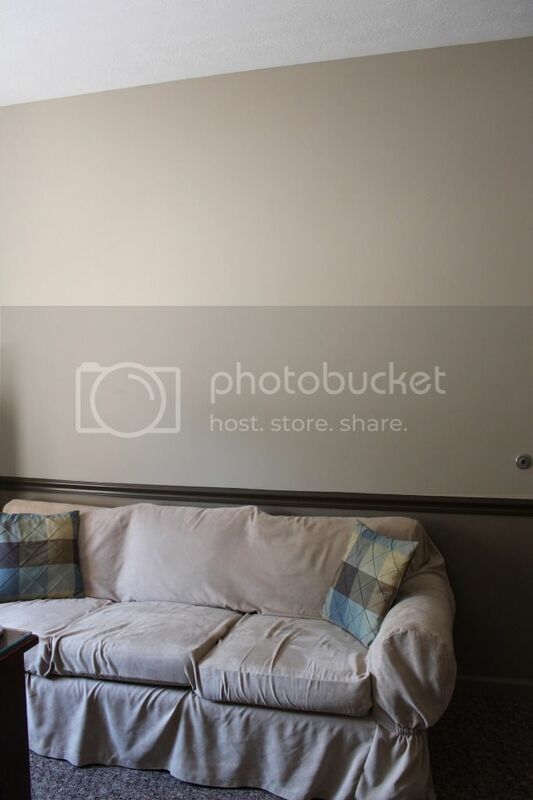 Insert my boring brown couch. We did have throw pillows at one point. 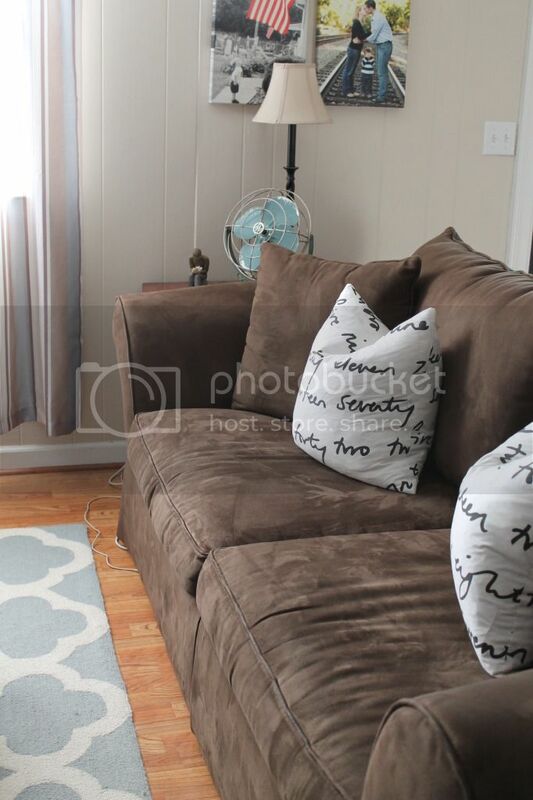 But in my opinion they competed with the curtains (both were satiny), and they just didn't stay clean. It was such a pain to have to wash them, and let them sit in the sun monthly. And I could only do it on Saturdays. And I had to pray for a non-rainy Saturday. So the pillows migrated to Josh's new office. They will be better loved in his office and there is less of a chance of toddler hands getting all over them. 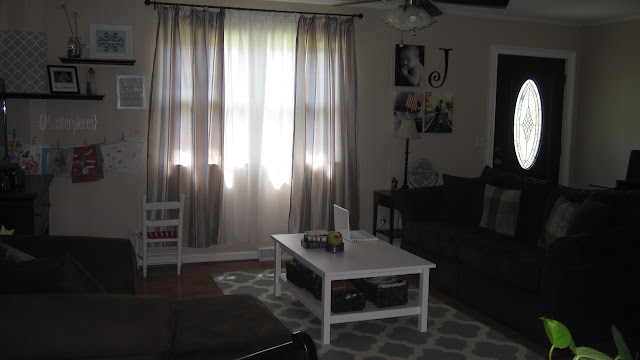 When we went to IKEA a few months ago I bought fabric for Josh's chairs/table. Are we having flashbacks to this post yet? When I had a few hours to devote to sewing I whipped up some covers for pillow forms I had sitting around. Josh's step-mom passed them on to me. They are comfy, squishy, and feathery. 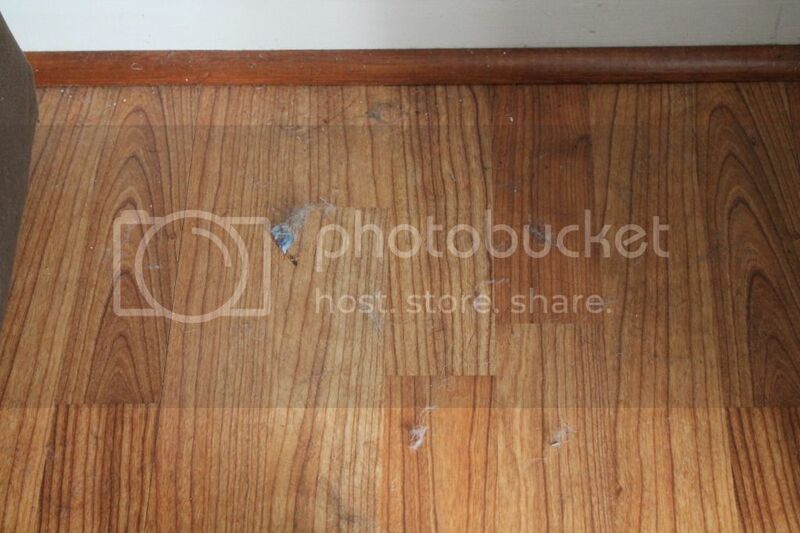 Much more welcoming than our stiff plaid pillows. And there is nothing my pregnant body loves more than to plop down on the couch with the laptop or a good book! In case your thinking "I thought she changed out the pillows because of dirty toddler hands, but she choose white fabric? What the heck is she thinking?" All the new pillows have been given a coating of Scotch Guard. As soon as I steam clean the new rug, it'll get a coat too! Love that stuff. Liquid just rolls off. Another coincidence? Look what I came across in BHG last month (I'm usually 1-2 months behind in reading my magazines). 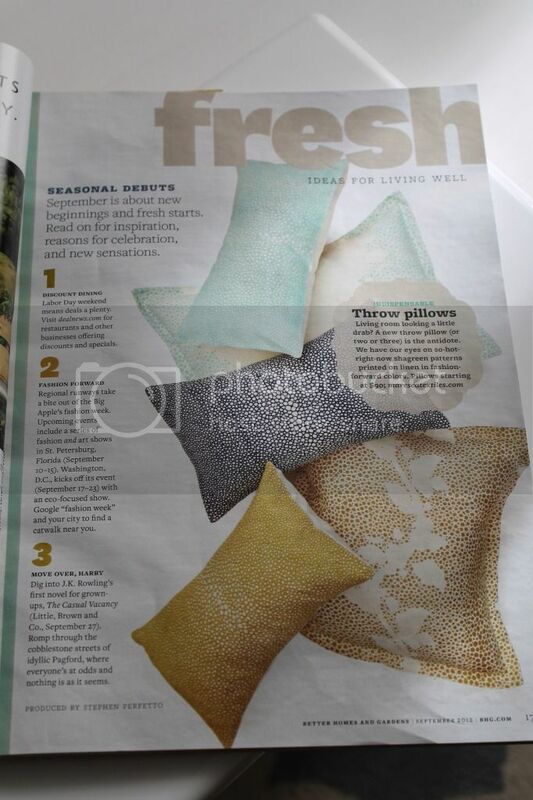 The article talks about how easily throw pillows can brighten a space. This is quoted from the "throw pillow" bubble on that page- "We have our eyes on so-hot-right-now shagreen patterns printed on linen in fashion forward colors. Pillows starting at $90." Uh say what?? 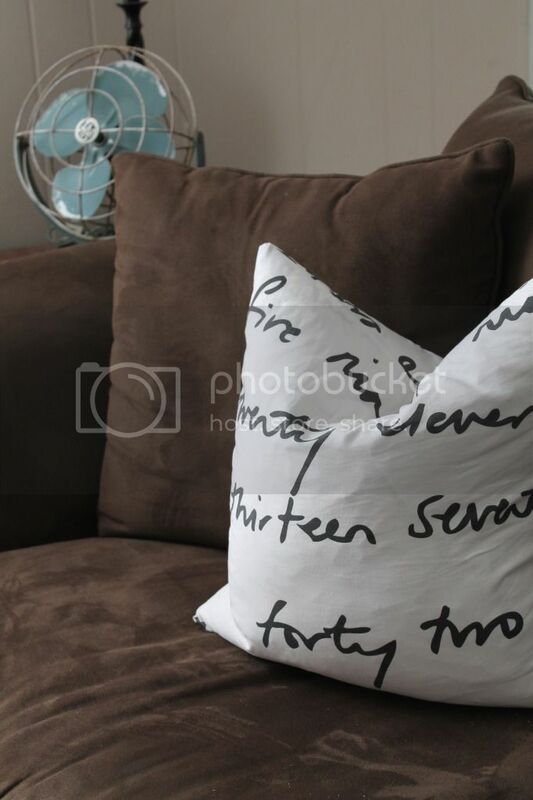 I would NEVER spend $90 on a throw pillow. But I can admire pretty things and figure out how to make my own for much less thanks.very.much. 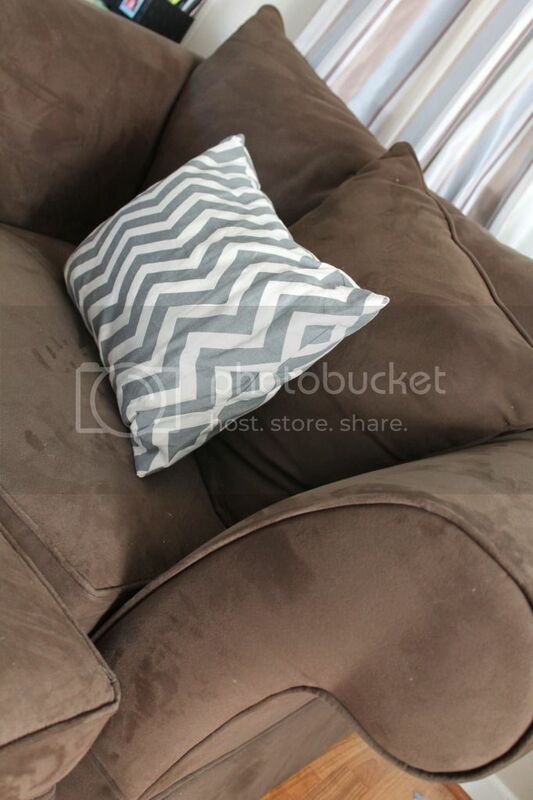 Like free pillow forms, plus $4.99 for the # fabric and $2 for the chevron. 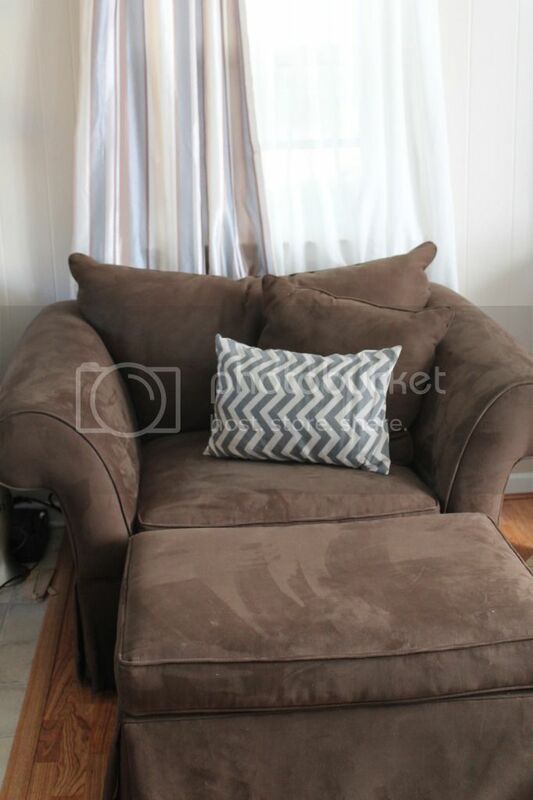 $7 for a couch makeover? Yes please! And here is more to look at! 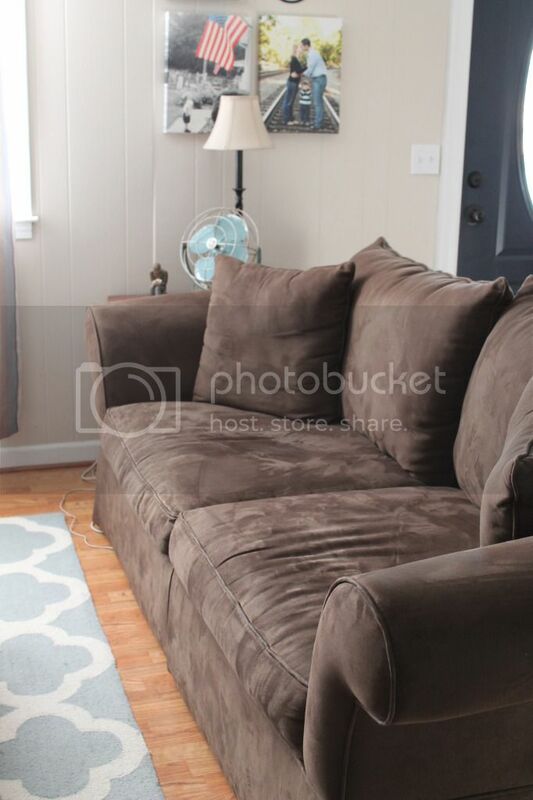 In the spirit of keeping things real- although I now believe my couches are bea-utiful, look no farther than a foot and you'll find some glorious dust bunnies. Baby steps. Maybe one day I'll have my life completely in order (sarcasm dripping from my mouth).